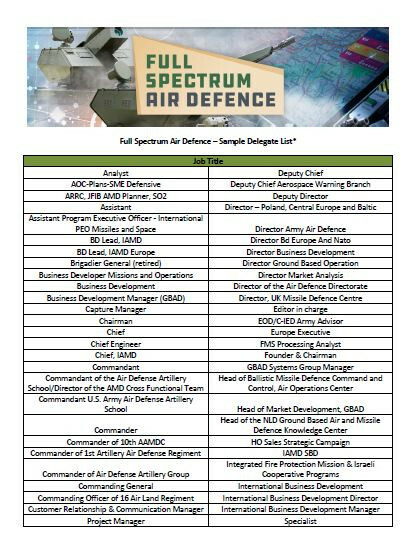 Why sponsor Full Spectrum Air Defence International? The Full Spectrum Air Defence International conference is the only opportunity to bring together air defence specialists from across the full air defence spectrum to gather and discuss strategic, operational, technical and risk considerations of air defence across the Full Spectrum of Air Defence on an international forum. The conference is attended by senior decision makers from across industry, bringing together buyers and suppliers in one location. Focused and high-level, the event will be an excellent platform to initiate new business relationships. With tailored networking, sponsors can achieve the face-to-face contact that overcrowded trade shows cannot deliver. Exhibiting and Sponsorship options are extensive, and packages can be tailor-made to suit your individual company’s needs. Download our past attendee list here or fill in the form below for further information.